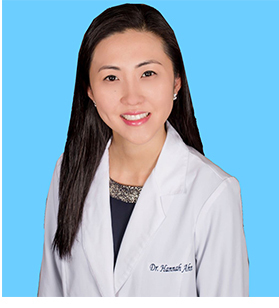 Dr. Hannah Ahn graduated from Columbia University College of Dental Medicine and completed her Pediatric Dental Specialty training at Columbia University Medical Center, New York Presbyterian Hospital. Dr. Hannah holds an academic appointment at Columbia’s Pediatric Dentistry department. As a Diplomate of the American Board of Pediatric Dentistry, Dr. Hannah's goal is to help create a fun and educational experience for children and parents. Dr. Hannah believes that every child is unique and strives to provide exceptional and professional care that is specific to his/her needs. She is looking forward to meeting you and your child and working together to create a lifetime of bright and happy smiles. Dr. Hannah has been voted by her peers to be a top dentist in the field of pediatric dentistry in Fairfield County and makes every effort to stay up to date with the changes and development in dental medicine. Dr. Hannah’s professional affiliations include the American Academy of Pediatric Dentistry, American Board of Pediatric Dentistry, American Dental Association, Connecticut State Dental Association, Connecticut Society of Pediatric Dentists, and Northeast Society of Pediatric Dentists. Dr. Hannah also speaks to young children at schools throughout our community. If you would like to arrange an interactive and educational presentation for your school, please feel free to contact Dr. Hannah at our office.